A lucky Las Vegas local, who asked not be identified by name, walked away with a $14 million jackpot from a Megabucks slot machine at Rampart Casino. At right, Michael Gaughan Jr., general manager of Rampart Casino, congratulates the winner. The casino is on the grounds of the JW Marriott Las Vegas Resort & Spa. The Vegas resident plans to donate the winnings to his church. For information, visit www.marriott.com/LASJW or call 1-702-869-7777. 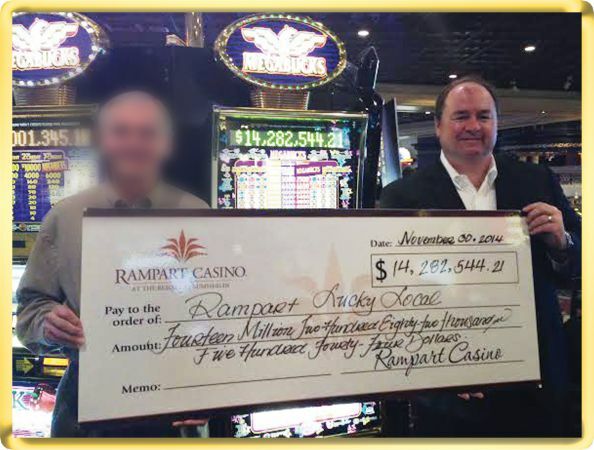 Las Vegas, NV – A lucky Las Vegas local has hit the jackpot of a lifetime at the Rampart Casino in the JW Marriott Las Vegas Resort & Spa. The local man, who has asked that his name not be released, put $20 in a Megabucks slot machine and within 5 minutes hit the progressive jackpot of $14.2 million. The winner claims he’s not much of a Megabucks gambler but decided to play the game at the casino near Summerlin with his best friend, who was in town visiting. The lucky man plans on sharing his success with causes close to his heart. In addition to contributing a portion of money to charity, the man will be donating funds to his church for a new building.The congregation has been using a high school gymnasium to worship. Joining in on the excitement of his win was Michael Gaughan Jr., general manager of Rampart Casino, who was on hand to congratulate the lucky winner. Known for attracting locals in Summerlin, Rampart Casino is on the property of JW Marriott Las Vegas Resort & Spa and offers visitors a diverse entertainment lineup with a variety of ways to get lucky. From slots and video poker to bingo and table games, the casino near Summerlin offers plenty of chances to win big, whether players are avid gamblers or a first-time players. Defining luxury, JW Marriott is one of the premier Las Vegas resorts and offers a prestigious retreat for unwinding after a day of winning big. Featuring a convenient location, just 15 minutes from the Las Vegas Strip, and exceptional amenities including an onsite spa, casino, golf course, 10 restaurants, a fitness center and waterfall pool, the upscale hotel gives guests everything they’re looking for in the beloved Sin City. Guests will fall in love with chic accommodations seamlessly blending style and function. Each of the elegantly appointed guest rooms feature plush bedding, flat-panel TVs, marble bathrooms and 24-hour room service. JW Marriott Las Vegas Resort & Spa at 221 N. Rampart Blvd. in Las Vegas, NV is 15 minutes from the Las Vegas Strip and near Red Rock National Park and championship golf courses. The hotel features 6 floors with 469 rooms, 79 suites, 33 meeting rooms with 100,000 square feet of total event space, a casino, fitness center, pool and 10 restaurants. For information, visit www.marriott.com/LASJW or call 1-702-869-7777. Marriott and the JW Marriott system are not associated with any part of The Resort at Summerlin other than the JW Marriott Las hotel at the resort. The casino is not part of the hotel or JW Marriott system. Learn more about JW Marriott and Marriott International Inc.